“On The Water Experience” For Our Veterans! At American Boat Charters, it’s our privilege to Honor “ALL” Veterans for their service to our Country. A “On The Water Experience” is our way of saying thank you. Coming from an ol’ paratrooper from Ft. Bragg NC, Captain Von knows firsthand what a day on the water can do for the soul. We ask all Veterans to give a hardy salute to Old Glory before stepping onto the boat for our day’s adventure. 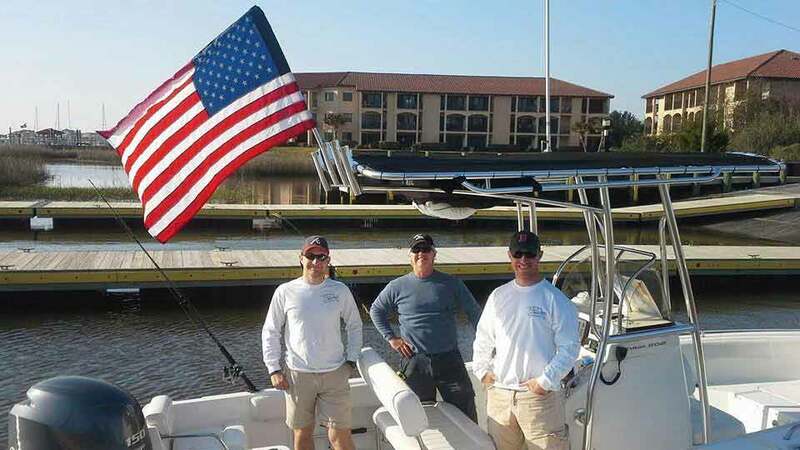 Veterans can always expect a great time on the water, whether fishing the back waters of Wrightsville Beach, Carolina Beach and Figure Eight Island or the waters off the beach. See our NC Coastal Charter Fishing page for more information. For up to three anglers. Add 50.00 for each additional person, up to 6 total. Don’t forget to sponsor a Veteran and get your name listed on our Website and social media outlets! We salute those in service and our veterans! When the flag is waving, there’s a Veteran on Board!